A magnificent example stands in Timahoe, County Laois which is 23kM from Mountmellick. Entered by a single doorway high above the ground, the multi storey building has small window openings and would have had wooden floors accessible by ladders. Most round towers are found near old churches or where churches existed at some time. This would place them in a ecclesiastical and monastic context. The exact date of construction for most round towers in unknown. However, research would place the round tower in Timahoe in 12th Century. History: Saint Mochua, who died in 657, established a monastery here in the seventh-century. Burned in 1142, it was re-founded by the O’Moores. The twelfth-century Round Tower with its impressively decorated Romanesque doorway is all that remains of the original monastic foundation. After the Suppression, the monastery and lands were granted to Sir Thomas Loftus and later (1609) to Richard Cosby. It was probably one of the Cosby family who transformed what was a medieval church into a castle. The last friar of the monastery was killed in 1650. 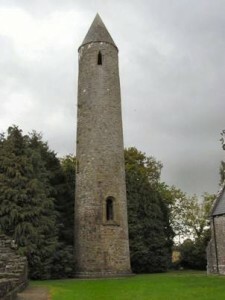 Location: Timahoe Round Tower is situated equidistant southeast from Port Laoise, and northeast of Abbeyleix. From M7 south, take R425 south to left on R 426. Timahoe village is approx. 10 km. down R 426. The round tower stands in a lovely park-like setting across a pretty footbridge that crosses the Bauteogue river in the centre of the village.